Grilled asparagus can be made using a grill pan, a hot grill, or if the weather allows, on the barbecue. This cooking method takes a short amount of time, with the direct high heat adding a distinctive charred flavour to the asparagus. Josh Eggleton blanches the asparagus in salted, boiling water for 1 minute before refreshing in ice water, then continues to step 2. This reduces the final grilling time of the asparagus and helps maintain the colour. Try using different flavoured oils or finishing with a squeeze of lemon. 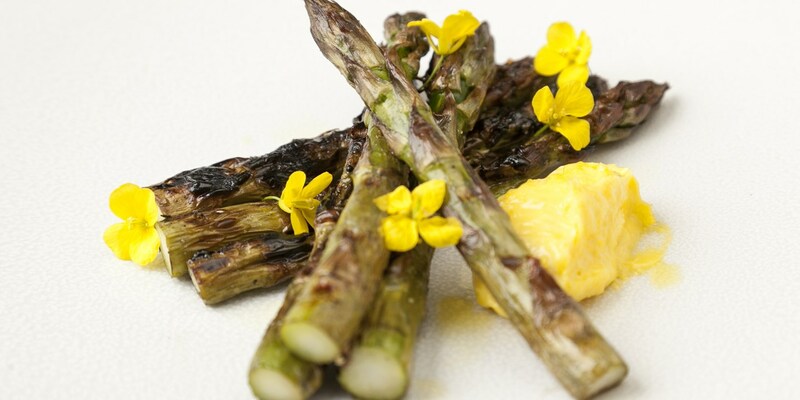 Galton Blackiston serves up his Barbecued asparagus with a beautifully light rapeseed mayonnaise, making a dreamy al fresco starter or side. Grilled asparagus makes a fantastic companion to a range of main dishes, from poached egg and Parmesan to a simple barbecued steak.